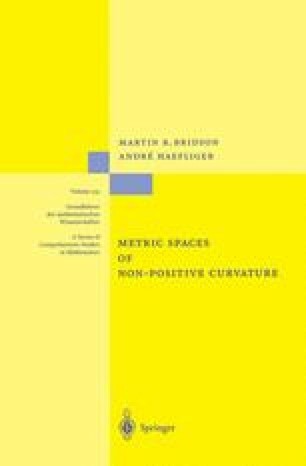 In this section we consider metric spaces in which the distance between two points is given by the infimum of the lengths of curves which join them — such a space is called a length space. In this context, it is natural to allow metrics for which the distance between two points may be infinite. A convenient way to describe this is to introduce the notation [0, ∞] for the ordered set obtained by adjoining the symbol ∞ to the set of non-negative reals and decreeing that ∞ > a for all real numbers a. We also make the convention that a + ∞ = ∞ for all a ∈ [0, ∞]. Having made this convention, we can define a (generalized) metric on a set X to be a map d : X × X → [0, ∞] satisfying the axioms stated in (1.1).